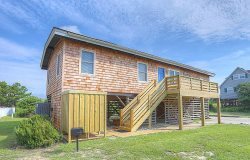 Located on a canal in the popular boating community of Colington Harbour, Seashells & Snowflakes combines a prime location with an assortment of amenities to ensure your next Outer Banks vacation is the best one yet. This spacious 3-bedroom home boasts beautiful views of the picturesque waterway that runs along the edge of the entire property. Spend your stay relaxing on the huge covered deck that faces the canal front, and watch dozens of boats sailing up and down the channel throughout the day. Outdoor enthusiasts staying at Seashells & Snowflakes will discover that launching a kayak or standup paddleboard has never been more convenient. With a private dock and direct access to the water from the property, there’s no need to drive your equipment to a local launch site—simply slide it into the canal and go! Kids and adults alike will enjoy crabbing from the private dock or along the bulkhead that lines the property. Where else can you catch your own seafood dinner right in your own backyard? If you’re planning to bring your four-legged friend on your next Outer Banks vacation, you’re in luck. Seashells & Snowflakes is a dog-friendly home that welcomes your furry family member to tag along during your stay! Tucked away toward the end of a quiet cul-de-sac, this vacation home offers guests plenty of privacy, as well as a safe place to go for a stroll with your dog or get in your daily jog. And because the Colington Harbour community is nestled along the wide expanse of Roanoke Sound on the western edge of the Outer Banks, you’ll see thousands of stars in the night sky when the sun goes down. Venture about a mile down the street to the sound front beach area, where you’ll find a sizable park and playground—and have the chance to witness some of the most spectacular sunsets on the Outer Banks as the sun slips into the Roanoke Sound. If you want to spend your escape to the Outer Banks enjoying waterfront living at its finest, book your stay at Seashells & Snowflakes today! 4.4 miles / 12 minute drive to Ocean Bay Blvd. beach access. Public parking is available.